Another beautiful painting! Keep them coming. I truly look forward to Monday each week! Thanks so much! Growing up in Jericho I’ve had the pleasure of being in this church a few times. It is so scenic and beautiful. Your paintings put me there on a slick wet Vermont day. Love the eye candy. What a contrast of years! 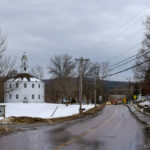 The old church of the early 1800’s with the new road having the divided lanes. Beautiful. You certainly did a marvelous job on this one Peter! Richmond is not that far away, so will want to visit when springtime comes! Thank you! Peter, I love these paintings that you post and learn so much from the description of each one! This round church in Richmond is something that I would love to see. Your work is very good! 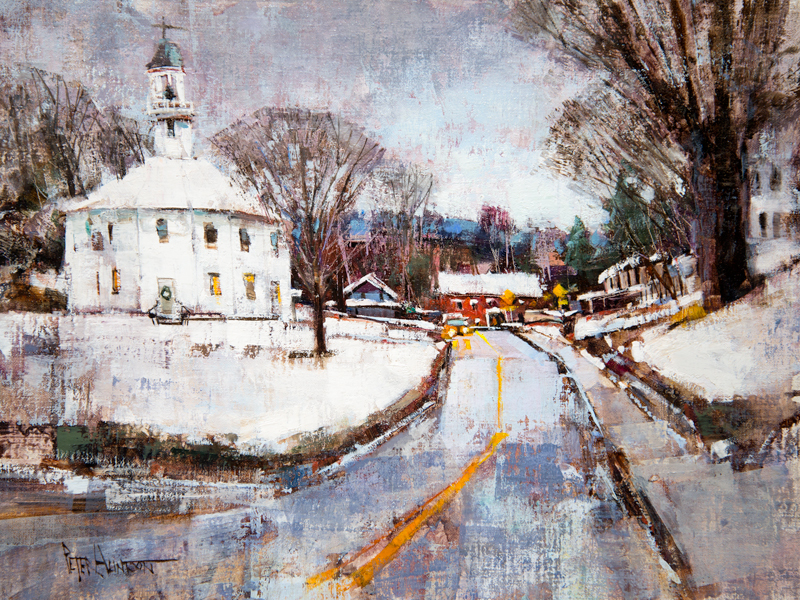 The timelessness and connectedness of land, sky, and antique buildings is reinforced by repeated use of light blues and grays and off-whites throughout the painting, with strategic warm colors adding sparkle and movement. I’ve always admired the round style of architecture. 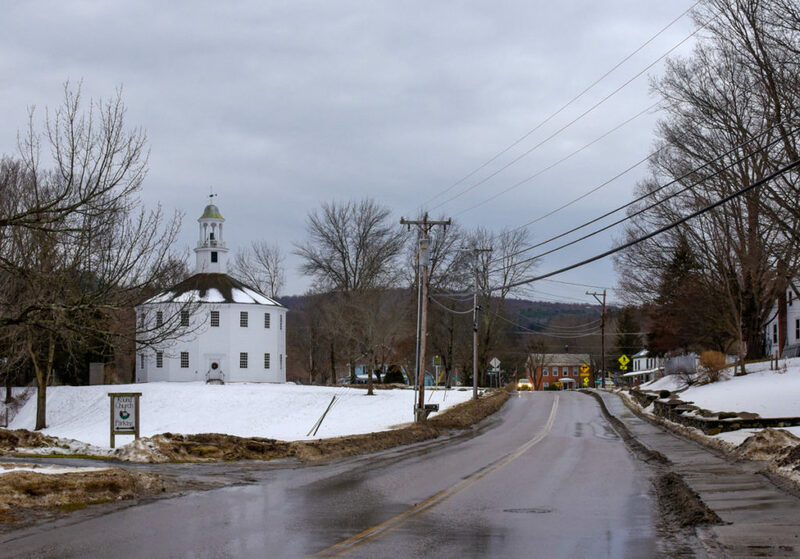 Another fine example of it is in the Shaker community in the Berkshires. There it was used in the building of a barn, where the round design helped in the efficient milking and feeding of the cows. Well, a round church has another Spirit than a long one. It is always a church for a preacher in the middle of the Community. In Germany we have so called rounded “Predigerkirchen”. We live in Richmond now and I still marvel at this view of the Round Church every day I drive by it! What a great painting, Peter! is such a beautiful state. Thank you for sharing. A beautiful painting! I like the shades of white throughout the landscape with that red building and the yellow road stripes giving color. Lovely. Nice print>>>>>>>> and do you know why the church is round .? Peter……………………………………. So the Devil can’t hide in the corner’s <<<<< Peace of the Lord always, Rick Stott. Hey Peter – by now you must be the oldest you’ve been so far! I’m just hoping wisdom comes along for the ride. It’s starting to get bumpy Sebastian! So beautiful. Saw this church one summer when I was in Richmond for NASCAR. Did lots of touring and really enjoyed it all. You work is beautiful. Just told a friend who moved from LI quite many years ago to Vermont about you. He’s on your site and thanked me for turning him on to you.thanks for bringing back fond memories. I love to see your rendition of America in the northeast. It never changes. Thank you for your paintings. They are a joy to the eye. Exciting colors!